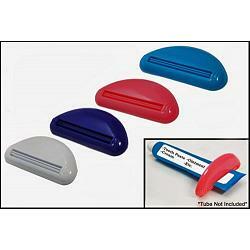 NEVER WASTE ANOTHER DROP OF ADHESIVE WITH THE TUBE SQUEEZER. OF COURSE, YOU CAN USE IT ON TOOTHPASTE, LOTIONS, OINTMENTS, ETC., BUT THE BEST USE IS ON TUBES OF SILICONE AND OTHER ADHESIVES. 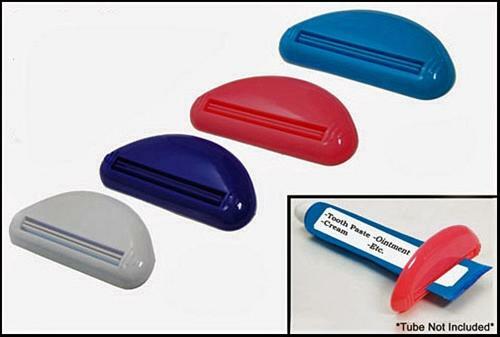 SIMPLY SLIDE THE SQUEEZER ONTO YOUR TUBE AND AS YOU USE THE ADHESIVE, SLIDE IT DOWN TO GET EVERY DROP FROM YOUR TUBE. WE ALSO FIND THAT AS THE TUBE EMPTIES, IT'S ESPECIALLY HELPFUL TO THE FOLD THE EDGES OVER AND SECURE IT WITH A METAL BINDER CLIP. NO MORE STRUGGLING TO SQUEEZE OUT THE ADHESIVE. THIS IS THE BEST KEPT SECRET WE HAVE! COMES IN DARK BLUE, LIGHT BLUE, PINK AND WHITE. WE WILL SELECT THE COLOR FOR YOU UNLESS YOU HAVE PREFERENCE. WHILE WE CANNOT GUARANTEE YOU YOUR COLOR, JUST LET US KNOW IN THE COMMENTS SECTION DURING CHECKOUT AND WE WILL DO OUR BEST TO ACCOMMODATE YOUR COLOR CHOICE OR GET ONE OF EACH COLOR!